Apple announced a short time ago that 25 billions apps have been downloaded from the App Store since it launched in mid-2008. 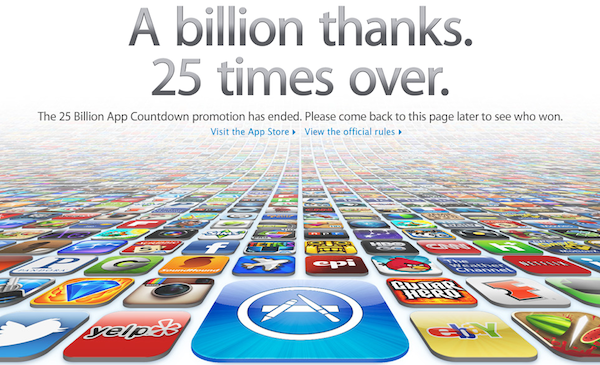 Apple has updated their homepage with the above graphic and slogan of "A billion thanks. 25 times over" and the App Store Twitter and Facebook accounts have also publicised the milestone. Interestingly, the graphic used by Apple varies depending on whether you are viewing an international version of Apple.com (such as Japan) or whether you see the standard US website. Apple will announce within a few days, who the lucky winner of a $10,000 iTunes voucher will be. Users could enter the competition by either simply downloading an app or filling out a form on Apple's website - the winner will be the person who downloaded the 25th billion app or the person who first filled out the form after the 24,999,999th app had been downloaded but before the 25th billion app. In Apple's previous App Store and iTunes competitions, Eddy Cue (Senior Vice President, Internet and Software Services) has called the winner and congratulated them on winning. Shortly after this has happened Apple releases a press statement announcing the download milestone and who the winner was. When Apple ran the competition to mark 10 billion apps downloaded, the winner initially hung up on Cue, thinking it was a scam call.